The plant communities that define this habitat comprise the Malcolmio-Linarietum sardoae, Sileno nummicae-Malcomietum ramosissimae and Senecioni leucanthemifolii-Matthioletum tricuspidatae associations. The plant communities that define this priority habitat (*) pursuant to the ‘Habitat’ Directive 43/92/EEC are dominated by thickets and small groves of Juniperus phoenicea subsp. turbinata, found especially on coastal and inland dunes. They require consolidated, moist dune communities that are not subject to erosion and where human activities such as trampling, grazing, and the setting of fires are limited, since these activities facilitate the spread of nitrophilous species and make these communities poorer in biogeographic terms and as a food source for wildlife. Threats: These communities are extremely vulnerable to dune destabilization. The management of sandy substrates, the absence of external impacts (buildings, sand quarries, trampling, off-road vehicles and machinery, planting of exotic species), and sound dune management are thus crucial to their survival. Main references: Farris E., Pisanu S., Secchi Z., Bagella S., Urbani M., Filigheddu R., 2007. Gli habitat terrestri costieri e litorali della Sardegna settentrionale: verifica della loro attribuzione sintassonomica ai sensi della Direttiva 43/92/CEE “Habitat”. Fitosociologia, 44(1): 165-180. Farris E., Pisanu S., Ceccherelli G., Filigheddu R., 2013. 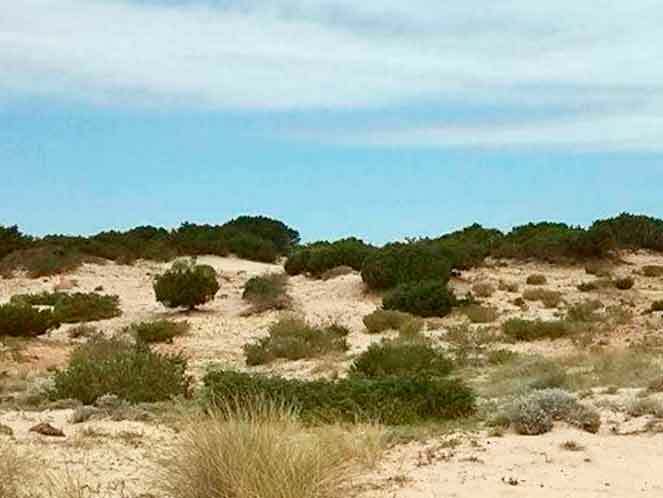 Human trampling effects on Mediterranean coastal dune plants. Plant Biosystems, 147(4): 1043–1051. Filigheddu R., Farris E., Pisanu S., Navone A., 2011. Analisi geobotaniche nell’Area Marina Protetta di Tavolara-Punta Coda Cavallo (Sardegna NE) a support della gestione della biodiversità. XIX Convegno del Gruppo per l’Ecologia di Base G. Gadio “Il ruolo delle aree protette per la tutela della biodiversità”. 21-23 maggio 2010, Olbia (O-T). Studi Trentini di Scienze Naturali 89: 133-136.